One soldier was killed and three policemen injured Sunday afternoon in a militant attack on a security personnel carrier in Egypt's volatile Sinai region, a military source said. The security personnel carrier was travelling on a motorway in the North Sinai town of Sheikh Zuweid, the source told Al-Ahram Arabic news website, without elaborating. "Unidentified gunmen opened fire on a military bus, killing a soldier and wounding three other policemen from the Central Security Forces," the army later said in a statement. The soldier who was killed was reportedly the bus driver. 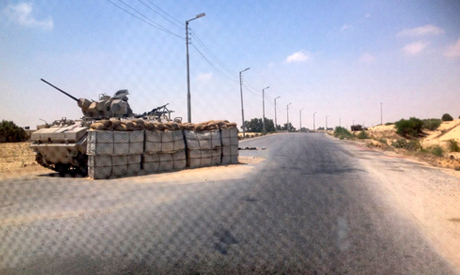 An Islamist insurgency targeting the police and the army has taken a heavy toll in the Sinai Peninsula, adjoining Israel. More recently, mainland cities have also been targeted. The frequency of attacks has increased since the army ousted Islamist president Mohamed Morsi last July following mass protests against his one year long rule. Almost 500 have been killed in militant shootings and bombings since mid-2013, according to estimates by Egypt's foreign ministry. The tally includes 438 policemen and troops and 57 civilians.